Properties in Irsina average 5 out of 5 stars. Casa Sorellina, a quiet place in the Italian countryside. 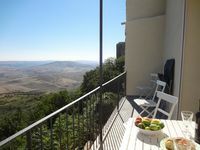 Property 2: Casa Sorellina, a quiet place in the Italian countryside. House near the historic center of Irsina. Property 3: House near the historic center of Irsina. Spacious house in the historic center of Irsina. Property 4: Spacious house in the historic center of Irsina. If you want to experience authentic Italy - Irsina is the place to visit. Ann and Jan were extremely welcoming and very helpful anytime we had questions. The apartment was comfortable, tastefully decorated and had breathtaking views of the valley. The kitchen had all the amenities necessary to cook meals and grocery stores were within a few minutes walk. Even doing laundry was an experience, as I hung our laundry on the rooftop terrace taking in the view of the valley below. Ann provided a binder full of everything you needed to know about the apartment, the history of the town, things to do and people to talk to depending on your personal interests. The people in town were friendly and loved sharing Irsina with us. If you love history or art and are looking for an authentic Italian experience - Irsina is the place to go and staying at Ann and Jan&rsquo;s VRBO apartment is the way to go. We will definitely be returning on our next trip to Italy.